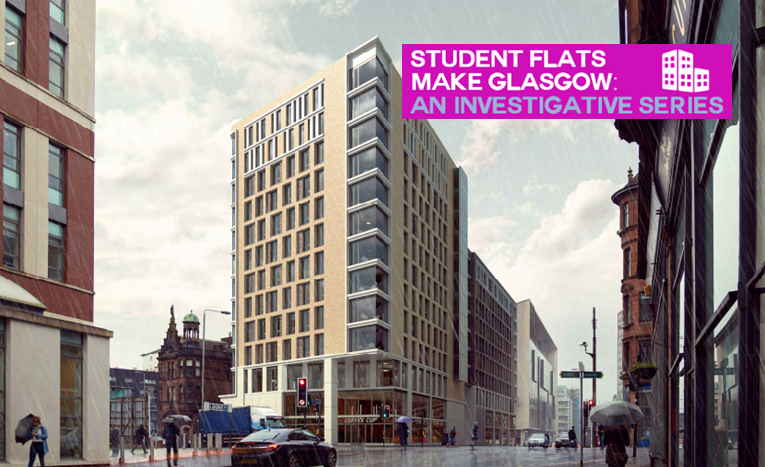 Kicking off a new series looking at the rapid rise of private student housing in Glasgow, A Thousand Flowers can reveal that one of the oldest buildings in the city has been earmarked for demolition, with a vast 12-storey, 426 bed student flat development set to take its place. In late December, an application was submitted to demolish the Old College Bar, the oldest pub in Glasgow which is located in the historic heart of the city on High Street. With the main structure of the building dating from the early 1800s, parts of the building’s basement are much older, perhaps dating to medieval times. Its name references Glasgow University, which was located over the road until the move to the west end in the 1870s, its buildings demolished to make way for a railway yard. Now one of the last links with that era looks set to be destroyed. Although there are various contenders to the title of Glasgow’s oldest pub, local experts consider the Old College Bar to be the true holder, as it was first licensed in 1812 and its basic structure has remained the same since, unlike other bars which have been rebuilt or moved site. Over recent years the Old College Bar has found itself looking increasingly out of place as Strathclyde University expands around it on one side and the office and student accommodation-led developments at “Collegelands” continue to its east. The back of the site now being proposed for development has been allowed to fall in to a state of dereliction and is barriered off by metal fencing. This is not the first time that the demolition of the remaining buildings on the site – comprising the large vacant corner unit alongside three independent traders and the bar, all set to now be evicted – have been mooted for demolition. In 2013, a planning application was submitted but ultimately stalled. 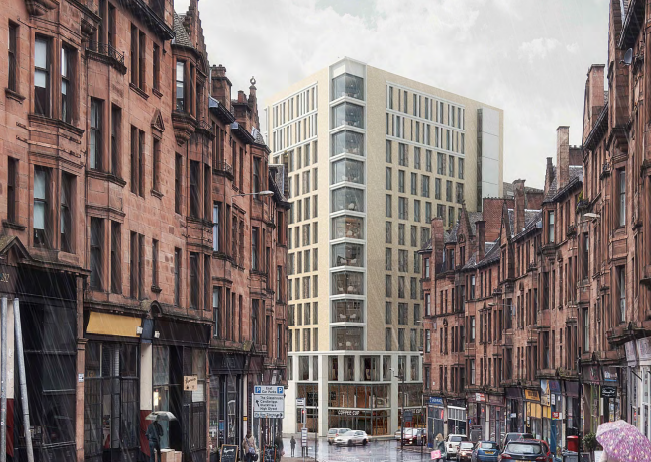 Now, however, the development has passed to Glasgow-based property developers Structured House, who submitted the recent application and claim that the existing site has a “negative impact” on the Central Glasgow Conservation Area. While making much hay of not intruding on the listed sandstone building next door, the application makes no reference to the pub’s heritage. Intriguingly, despite being located in the Conservation Area and with its well documented connections to the city’s past, the Old College Bar has never been given the protection of listed status. This lack of foresight has meant that key heritage assets – such as the remains of a cobbled street within its basement – have been subject to DIY maintenance jobs over the years and not treated with the sort of care that being listed would require. In a submission to planners by local historian Diana Connell, the cellar is described as the “oldest remaining sub-structure on the High Street of Glasgow”, adding that “the building in question probably dates to about 1470”. The application to demolish the buildings on the site is currently being considered by the council. It follows a consultation last year where virtually all respondees were against the proposed development. The development comes at a worrying time for small traders on the remaining tenements on High Street, who have been locked in a bitter dispute with council ALEO City Property over the last few years, alleging poor upkeep of their buildings by the landlord, with dryrot and sewage seeping into their basements. The latest stage of this dispute saw one business being served with an eviction notice last week. They have come to dominate the skyline in Partick, Kelvinside, much of the city centre, and around the Merchant City, combined forming one of the most profound changes to the city’s built landscape over the last few decades. Over the coming months, this blog will be dipping inside this trend, exploring its size and scope, scrutinising what these changes mean for students and communities alike, the sustainability of this investment bubble, and who is really profiting from it. There may be some interesting results. In principle, I don’t have an issue with the idea of student accommodation. In practice though? My impression is that these developments are almost always priced outside the reach of a student’s grant or loan, and are supplemented by the bank of (middle class and upper) M&D. Obviously, there’d be no point in providing accommodation for a famously low-income demographic unless you could find at least one way of making fat stacks. Education is a fantastic business opportunity, and social mobility is an incredible con trick. Certainly an interesting topic and one with history behind it. Remember the student accommodation appearing 30 years back in places like Ruchazie, Castlemilk and Red Rd. It was a holding idea before they eventually pulled the houses down and rebuilt. But this is serious money. What does a 12 storey building cost these days. There’s even talk of one in the Trongate. And what happens in the summer when the students leave. Does Glasgow become a ghost town?